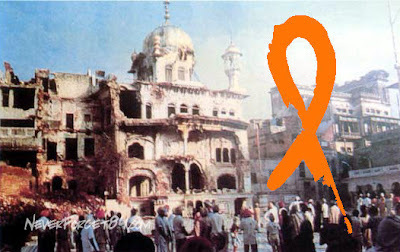 The 24th anniversary of the 1984 Holocaust by the Indian Government on Innocent Pilgrams at the Darbar Sahib is coming up. We urge everyone to change their profile picture to the following from June 3rd to June 6th in remembrance and respect for all the innocent men, women and children that were brutally murdered by the Indian Military Forces in the Massacre termed "Operation Bluestar". If you have any difficulty accessing this image, it is also posted in the group under images with the caption "profile picture" and will be posted as the groups profile picture for the next 3 days. For more information regarding Massacre Bluestar please feel free to post in the group or personal message any of the admins. I would agree that the Bluestar Massacre was not about Hindu religious beliefs at all, and Hindus, in general, ought not to be blamed either for the loss of life here or later in the Delhi Pogrom (and elsewhere in India) of Oct-Nov, 1984. It remains the fact however, that the ones who planned and implemented these attacks were, by and large, Hindus. In addition, the whole Hinduvta movement looks to assimilate us Sikhs into the Hindu fold by denying our existence as a separate religion (as does, by the way, the Indian constitution). 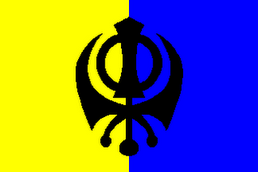 It should thus be understandable if there is some tension between the Sikhs and the Hindus. I look forward to the day when we will feel truly able to trust each other as sisters/brothers. Sadly, that day is not yet. Several things will have to be accomplished before that can happen. 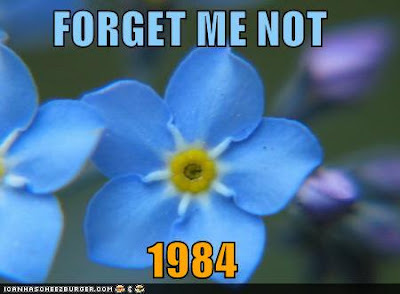 The wounds of 1984 have not yet healed. When the Congress Party throws salt on our still-open wounds by trying to run antiSikh criminals such as Jagdish Tytler and Sajjan Kumar and when those who called for "Blood for blood," such as Amitabh Bachchan are beloved national icons, this day is pushed further into the future. I do not blame the whole Hindu community for the murder of my husband and son and unborn daughters and brothers and other family members. Still, it remains that their killers, their murderers were Hindus. I think a reluctance on our part to embrace our Hindu cousins as sisters/brothers is understandable. There is a feeling among many Sikhs that it was our blood that bought Indian independence (Gandhi could have accomplished nothing without the ground being watered by the shed blood of the Sikh freedom fighters before his satyagraha movement.) This was certainly a very strange way of saying "Thank you" to us. Promises made to the Sikh community by Nehru and Gandhi for our national freedom were broken without apology, with only the glib statement, "The situation has changed." This was the real beginning of the trouble betweeen the two communities as I see it. There is much more to be said about this, but let me finish by saying that the situation is not a simple one and this chasm will not be quickly or easily healed. People of good will on both sides need to work for this if it is ever to happen. 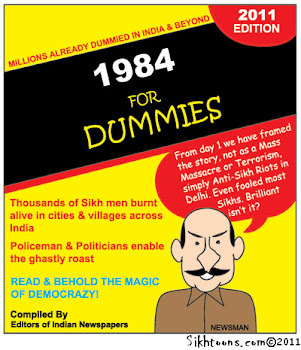 If we Sikhs see, over a period of time that these actions against us in and after 1984 were an aberration and our existence as the Sikh nation is recognised, perhaps the close and loving relationship between the two groups can be rebuilt. But this will take a lot of work on both sides. Let us for now wish each other well and work for a better future.